Hear me, dearest mother, hear me. Spare me, dearest mother, spare me. Following The capricious lovers, the next new opera to be presented at the Theatre Royal, Drury Lane was Pharnaces, which received its first performance on 15 February 1765 and was the latest in a long line of attempts to replicate the tremendous popularity of Thomas Arne’s Artaxerxes down the road at Covent Garden. The text was by the actor Thomas Hull and the music by William Bates. We know even less about William Bates than we do about George Rush, and unlike Rush and Samuel Arnold he was not even mentioned among the hundred and twenty or so people whom Leopold Mozart listed as having met during their time in London. 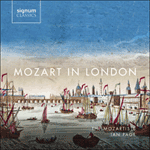 He was active in London between 1750 and 1780, and wrote instrumental works as well as copious songs for London’s theatres and pleasure gardens. The story of Pharnaces would have been familiar to at least some of the original audience, for six years previously the King’s Theatre, Haymarket had presented an Italian setting, Farnace, with music predominantly by Davide Perez. Virtually all the characters are hell-bent on revenge, with the Roman general Athridates attempting to capture and murder Pharnaces’ young daughter. When he does eventually capture her, though, he soon discovers that the child’s mother, Tamiris, is in fact his own long-lost daughter. The child’s earlier lament, 'In this I fear my latest breath', in which she begs her mother to save her from an early death, is particularly touching, but Roger Fiske, the distinguished scholar and chronicler of this period of English music theatre, was clearly hedging his bets when he wrote that the music of Pharnaces 'is not worse than most of its kind'.